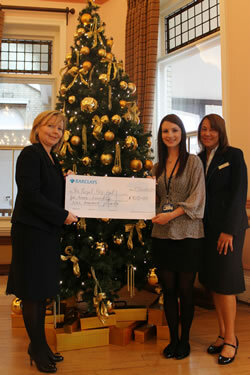 The Royal Hospital for Neuro Disability on West Hill, Putney, got a welcome Yuletide boost of £900 for its funds last week (Dec 19) when Barclays Bank Area Director for West London Vanessa Lavery (left) and Maureen Davies (right), manager of the Barclays Bank branch in Putney, handed over a cheque for that amount to Anna Wall-Budden (centre), who is in charge of fund-raising at the hospital. Maureen raised approximately £450 from a local Barclays charity evening at the Star and Garter in Putney recently, and after consulting local Thamesfield councillors Rosemary Torrington, Jim Maddan and Mike Ryder, picked the hospital as a truly worthy local cause to receive the money, which was doubled by Barclays area management. The hospital treats patients with severe brain and neurological disabilities, many of them road crash victims but also including wounded soldiers from Afghanistan.